The Mac Factor Blog: Offset Backup Irons: Do I Need 'Em? Offset Backup Irons: Do I Need 'Em? 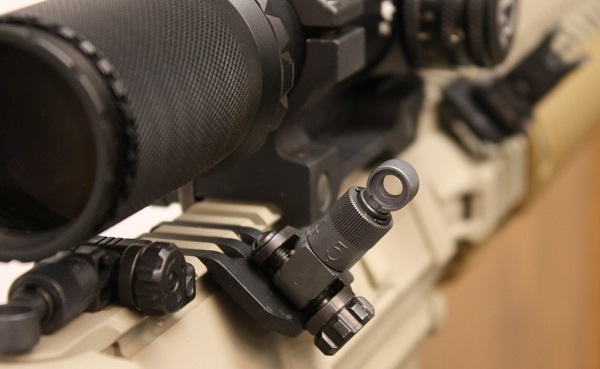 Most people add backup iron sights to their AR-15 rifle in the event their red dot optic fails. Competitive shooters may have a little different approach. The chances of a 1-4 power scope failing during competition are extremely unlikely. But what is likely is that you will be presented with multiple rifle targets at different ranges which will require you to adjust your scope power during a stage. This of course takes time and can be inexact. Turning the scope ring is made easier by some of the "cat-tails" scope companies make, but those take up space and stick out on top of the rifle. What about another option? What about an offset optic at 45 degrees? Now you see where I'm going with this. Having 45 degree offset mounts on your 3-gun rifle will allow you to quickly cant the rifle to the side and engage targets without having to drop the rifle from your shoulder and use a hand to change the power of the scope. The action of switching to offset iron sights should be rapid and take less than a second, allowing you to keep your eyes downrange and keep moving through a stage. When you are talking about WINNING 3-gun competitions and not just showing up and participating, every second matters. Guys like Daniel Horner and Keith Garcia win competitions by fractions of a second. So the time you save by not manipulating the scope power may take you to the top of the leaderboard. There's a major reason why I'm leaning toward iron sights versus something like a red dot. Adding the second optic to the rifle immediately moves you into Open division. I've got no desire to go there as of now. When trained appropriately, iron sights can be used as accurately and efficiently as red dot sights on AR's. So what are your options when it comes to offset iron sights? The big name in "rapid transition sights" has been Barry Dueck from Dueck Defense, himself a 3-gun competitor. 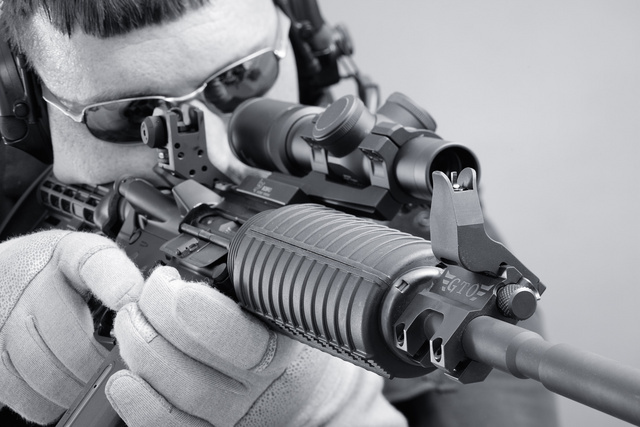 Since he popularized these sights on the 3-gun circuit, several other companies have gotten in on the action, namely Knights Armament and Surefire. All three of these companies offerings mount directly to the Picatinny rail and are fixed sights, meaning they don't flip up or down. Another option would be to add a small 45 degree rail section, such as the Daniel Defense 1 o'clock offset rail and put any of your standard back up sights on. Most people have backup irons such as Magpul or Troys already and could easily pop these on the rifle. The downside is that they would have to be flipped up, and there would also be the potential for them to get accidentally flipped up or down during movement. So I'm currently thinking heavily about trying this setup out. I'm currently running my Vortex Viper PST 1-4x with no irons on my 3-gun rifle. What I'd like to do is keep the scope at 4x for shots longer than 50 yards or so, and have the irons to engage all of the close quarters shots. The matches I shoot in usually have the majority of the targets within 10 yards, with a couple out at 100. I think this setup would RULE.